I can clearly recall the first time I saw Emmanuelle Alt on Pinterest. I was immediately mesmerized by her casual yet classy style. She, clearly, was Parisian. She had that effortless style that Parisian women are famous for. Her uniform is distinctly her: skinny, ankle length pants (often cuffed), a button down shirt, a blazer, and a strappy heel, simple ankle bootie or flat. Sounds boring, right? Actually, it's anything but. 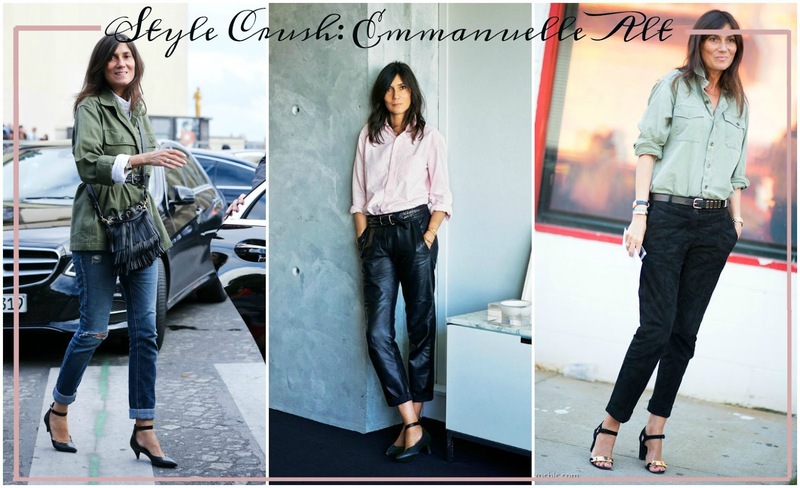 Emmanuelle Alt has perfected making the simplest of outfits look interesting, and that is precisely what I love about her. A simple striped shirt? She crushes it by pairing it with black skinnies and a white blazer. She is killing this distressed denim. Simple black heels and black on top keeps this look polished even with a gaping hole in her jeans. Chambray never looked more chic. Her "borrowed from the boys" style is anything but boyish. She has an impeccable ability to make even the most masculine of clothes look feminine. Just when you start thinking prints weren't her thing, Alt nails it with an animal print coat. Let's talk textures. Love this pairing of the knit sweater with the fur coat. It's perfection. Who can make an Oxford shirt look stylish? Only Emmanuelle Alt.